Look for a waxing crescent moon passing the diminishing Red Planet during the evenings of Dec. 4 and 5. Back in the spring, Mars was a dazzling yellow-orange light visible low in the southeastern sky just after sundown. On May 22, Mars was at opposition to the sun, and eight days later, the Red Planet made its closest approach to Earth since October 2005. Mars came to within 46.8 million miles (75.3 million kilometers) of Earth and shined nearly twice as brilliantly as Sirius, the brightest star in the sky. On Sunday evening, look about one-third of the way up from the south-southwest horizon about an hour after sunset to see a 25-percent-illuminated waxing crescent moon. Mars will sit about 6 degrees to the right of the moon. The Red Planet is now setting about 5 hours after sundown. As we have noted many times before, your clenched fist is roughly equal to 10 degrees when held at arm's length. So Mars will appear just over "half a fist" from the moon. If you own a telescope, even a moderately large one, I wouldn't really bother training it on Mars. The planet's disk has now shrunk down to less than 6 and one-half arc seconds in diameter. Put another way, you would need a magnification of no less than 280 power to enlarge Mars to the apparent size of the moon as seen with the naked eye. For most instruments, Mars will resemble nothing more than a pumpkin-hued circular dot of light. And of course, because the moon is so much nearer to Earth than Mars — about 239,500 miles (385,200 km) away — the natural satellite appears to move much more rapidly against the background stars than the Red Planet does. The moon will pass to the north of Mars during the mid-to-late morning daytime hours of Monday. 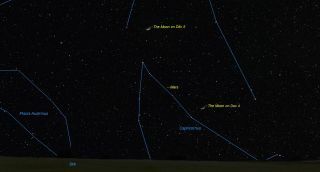 Both Mars and the moon will have long since set and will be below the horizon as seen from North America. So on Sunday evening, the moon will be approaching Mars, but 24 hours later, the satellite will be well to the upper left of Mars and leaving the Red Planet far behind.